Current Publisher does not properly recognize Adobe Fonts. Current beta does not recognize Adobe fonts and substitutes them with fonts that are not appropriate to the users choice. See screenshots. When the problem is recognized the problem can be corrected manually…see second screenshot. The screenshots are pretty clear.  Notice that Publisher sees AdobeCaslonProBold as missing and makes a gustation. In the second screenshot, I make a substitution for Publisher's substitution by manually choosing the correct font in each of its faces that Publisher says are not there. I am currently running a 2017 5K Retina iMac and Mojave 10.13. Try to reset Publisher. I don't have that problem and I run on Mojave. The problem is not the font, but embedding in PDF. Publisher actually doesn’t support embedded fonts in a PDF. I have had this situation occur infrequently, but quickly discovered that it in my case — at least — it was simply a matter of spacing between words. One font I have used for titles in several PDFs is Charlemagne. When importing, it was listed as Charl and Publisher couldn’t find it. So when I looked through MAC fonts I found it, and fixed the name there. 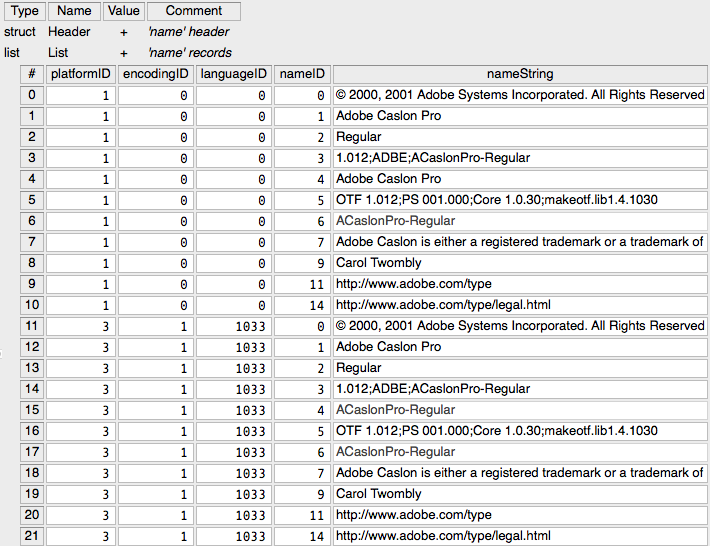 I have quite a few Adobe fonts in my MAC and they are all useable, once the correction in file names is fixed. One of the first things I did with the very first Beta was to check out all my fonts. No problems. I am sticking with MAC Sierra. Is this true? And if so, only temporary? I'm going to need embedded fonts in some of my workflow. Anyone care to reply? I must say that I am unsure what embedding fonts has to do with the apps ability to make a correct substitution of a font. As can be seen from the screenshots the fonts are present and when the app is shown them it was fully able to use them. When I made the substitutions the PDF used them and all of my other PDF reading apps had no questions and correctly ID'd the fonts correctly. Publisher is the only PDF app I own that makes this error. Acrobat DC Pro recognized them, QuarkXpress recognized them. As did PDF Expert, Cisdem Reader etc. 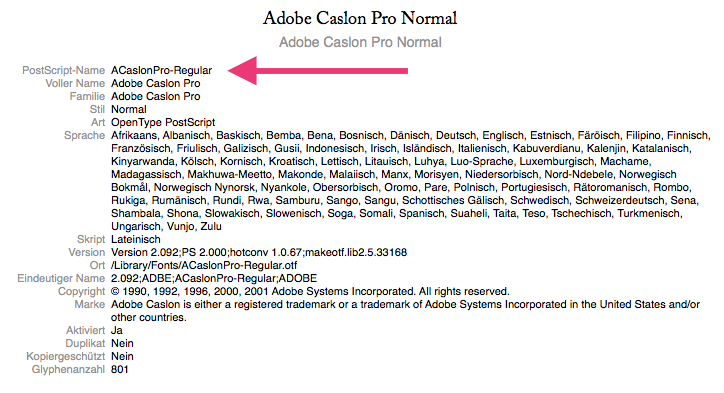 It does not seem to me to be an issue of spacing as Adobe surely has named its fonts correctly. If I am not understanding the matter correctly, I am open to being taught…seriously, old I am, but my mind is still occasionally pliable. Publisher can embed fonts into a PDF when creating them, but cannot currently make use of fonts from PDFs that it imports. I believe this is because it always imports PDF files in an editable format and embedded fonts in PDF files are only meant to be used when the content cannot be changed. And if so, only temporary? I don't think we have seen a clear answer on this. I suspect it may be the way the names are mangled when stored in the PDF file. Note that the spaces between the words were removed and the style was appended. Wondering if Publisher is possibly not matching the names up in this case and doesn't recognize them as a match. I don't know if this could be an issue with the way Publisher is interpreting the data or if the source program is not storing them correctly, or if I am completely off here - just a hunch. I am also inclined to believe it has to do with the font names. Where did you get the PDF from? Did you create it from Affinity Publisher yourself? 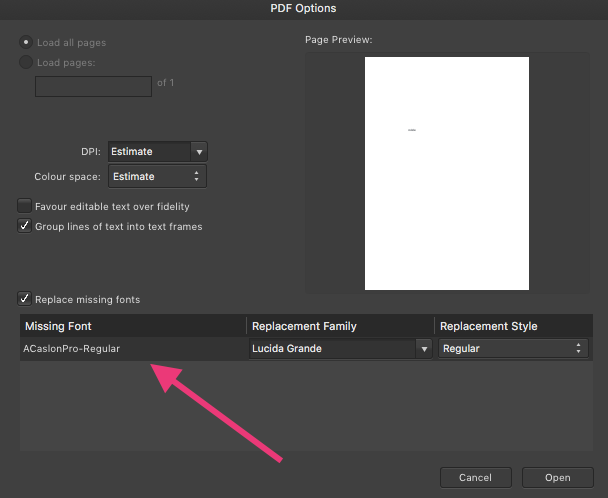 If not, there might be a chance that the fonts used in the PDF were actually different ones … or differently named ones. Thanks! You could well be right. I have had this collection of Adobe fonts for some years now. I am going to see about updating them to see if that solves the issue. I think that my set of Pro fonts may be about 10 years old. They work beautifully…I hope that I do not have to update them because the cost would be prohibitive. It would be nice to have a table of "when you see this font", "replace it with this font", so that when we see these issues come up frequently we can set up our own mappings rather than having to adjust it each time. As A_B_C mentioned above, where did the PDF come from? What is exported from Affinity Publisher or another app? Would it be possible to PM these fonts to me so we can take a look at them? PDFs (and iOS) use the Postscript Name in the font name table to identify the font. As mentioned above an example of this Postscript Name is ACaslonPro-Regular in the current Adobe version of this font. Your older font may be different or actually missing this field in the font. If this field is missing there are some guidelines in the PDF specs on creating a compatible name. So it would be good to take a look at the fonts (and the PDF) to see what is happening. We can look at the PDF and see the actual names used to embed the fonts. We can look at the fonts and see the names used in the font file. If these are OK then there may be an issue with APub. Since the import into other apps seems to work properly this appears to be an APub issue. I doubt it will be legally fine to share copyrighted fonts across the internet. However, GreatSouthernBear can follow your suggestion himself. It’s just a matter of looking at the font in Font Book > Information Tab. Here you can see the Postscript Name of the font. As far as the PDF goes, it would indeed be useful to take a look. I don't think the font police are going to break down the doors of some software testers. I already have Caslon Pro. But I would like help solve any font issues with APub. And in this case that means looking at the fonts and the PDF together to see what is happening. But if people are that paranoid I guess they can just deal with the problem themselves. I perfectly understand that your intention was to help. Nonetheless, I believe paranoia is the wrong descriptor in this case. Whoever has tried to create a typeface once in their lives will surely know what a terrible amount of work and expertise is required for such an endeavour. So copyrights are there for a good reason. Which basically goes without saying, of course, and I am sorry if you had the impression that I would not acknowledge your intention to help. You might have got me wrong. I just meant to point at an additional way the OP could research into the issue himself. That depends on the license. Something can be copyrighted and still licensed in a way that makes it free to distribute, and fonts under licenses such as OFL fall into that category. However, I certainly agree that if the license does not permit it, as would very likely be the case with fonts from Adobe for example, then it should not be done. That’s true. Thank you for this clarification. According to FontExplorerX, FontBook,FontDoctor and others my fonts and their names are fine. As I said earlier, Quark, InDesign, PageMaker all say that the fonts are sound and named correctly, they have zero problem recognizing them as named. One other point I have used FontExplorerX to check the fonts in the various PDFs and it says the fonts are correctly named and has no problem recognizing them. Inasmuch as I own these fonts and not from the Cloud, nor leased etc, if contacted, I would be willing to share a couple of samples if someone is able to verify them and try them in Affinity to see if they get the same result. Still don't see an answer as to where this PDF came from. Did you create this PDF using the Adobe Caslon fonts you currently have installed? What application was used to create the PDF? Are these Postscript Type 1 fonts? Are these old-style Mac TrueType fonts? Which font name table field is providing these names? Where is APub getting these names? Are those the postscript names we see in the PDF viewer when we look at "text properties?" InDesign appears to be better at guessing correct fonts with little or poor font naming. An APub user recently sent me some family fonts which APub was having problems with selecting and displaying properly. They were as I suspected poorly converted mis-matched fonts with inconsistent naming. I fixed them and sent them back. Then they worked fine in APub. The main take-away I got from that is how did InDesign properly figure-out that mess? That may be the situation here. and to make sense of bad or missing naming fields, and simply bad fonts. APub should be better at guessing the best font replacement. Whenever possible it should help users deal with those bad font issues. It is obvious that this is what other apps are doing. Font families using up-to-date naming best practices rarely have any problems. It is the older fonts with minimal or missing name data which cause the most problems. And a surprising number of modern fonts are actually broken, both FOSS and commercial. No one can diagnose this issue without answers to the above questions. No one can diagnose this issue without looking at the actual PDF and the actual fonts. Serif developers cannot test this with just some pictures.